For other uses, see Nevada (disambiguation). "Silver State" redirects here. For other uses, see Silver State (disambiguation). 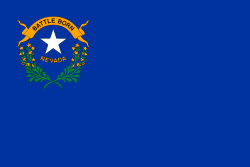 Nevada (/nɪˈvædə/) is a state in the Western United States. It is bordered by Oregon to the northwest, Idaho to the northeast, California to the west, Arizona to the southeast and Utah to the east. Nevada is the 7th most extensive, the 32nd most populous, but the 9th least densely populated of the U.S. states. Nearly three-quarters of Nevada's people live in Clark County, which contains the Las Vegas–Paradise metropolitan area where three of the state's four largest incorporated cities are located. Nevada's capital, however, is Carson City. 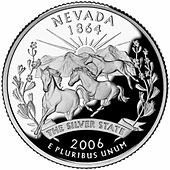 State song(s): "Home Means Nevada"
Nevada is officially known as the "Silver State" because of the importance of silver to its history and economy. It is also known as the "Battle Born State", because it achieved statehood during the Civil War (the words "Battle Born" also appear on the state flag); as the "Sagebrush State", for the native plant of the same name; and as the "Sage-hen State". Nevada has a reputation for its libertarian laws. In 1940, with a population of just over 110,000 people, Nevada was by far the least-populated state, with less than half the population of the next least-populated state. However, legalized gambling and lenient marriage and divorce laws transformed Nevada into a major tourist destination in the 20th century. Nevada is the only U.S. state where prostitution is legal, though it is illegal in Clark County (Las Vegas), Washoe County (Reno) and Carson City (which, as an independent city, is not within the boundaries of any county). The tourism industry remains Nevada's largest employer, with mining continuing as a substantial sector of the economy: Nevada is the fourth-largest producer of gold in the world. The name "Nevada" comes from the Spanish nevada [neˈβaða], meaning "snow-covered",  after the Sierra Nevada ("snow-covered mountains"). Most Nevadans pronounce the second syllable of their state name using the TRAP vowel (/nɪˈvædə/). Many from outside the Western United States pronounce it with the PALM vowel (/nɪˈvɑːdə/). Although the latter pronunciation is closer to the Spanish pronunciation, it is not the pronunciation preferred by most Nevadans. State Assemblyman Harry Mortenson proposed a bill to recognize the alternate (quasi-Spanish) pronunciation of Nevada, though the bill was not supported by most legislators and never received a vote. The Nevadan pronunciation is the de facto official one, since it is the one used by the state legislature. At one time, the state's official tourism organization, TravelNevada, stylized the name of the state as "Nevăda", with a breve mark over the a indicating the locally preferred pronunciation which is also available as a license plate design. Much of the northern part of the state is within the Great Basin, a mild desert that experiences hot temperatures in the summer and cold temperatures in the winter. Occasionally, moisture from the Arizona Monsoon will cause summer thunderstorms; Pacific storms may blanket the area with snow. The state's highest recorded temperature was 125 °F (52 °C) in Laughlin (elevation of 605 feet or 184 meters) on June 29, 1994. The coldest recorded temperature was −52 °F (−47 °C) set in San Jacinto in 1972, in the northeastern portion of the state. The southern third of the state, where the Las Vegas area is situated, is within the Mojave Desert. The area receives less rain in the winter but is closer to the Arizona Monsoon in the summer. The terrain is also lower, mostly below 4,000 feet (1,200 m), creating conditions for hot summer days and cool to chilly winter nights. The largest mountain range in the southern portion of the state is the Spring Mountain Range, just west of Las Vegas. The state's lowest point is along the Colorado River, south of Laughlin. Nevada has 172 mountain summits with 2,000 feet (610 m) of prominence. Nevada ranks second in the United States by number of mountains, behind Alaska, and ahead of California, Montana, and Washington. Nevada is the most mountainous state in the contiguous United States. Nevada is the driest state in the United States. It is made up of mostly desert and semi-arid climate regions, and, with the exception of the Las Vegas Valley, the average summer diurnal temperature range approaches 40 °F (22 °C) in much of the state. While winters in northern Nevada are long and fairly cold, the winter season in the southern part of the state tends to be of short duration and mild. Most parts of Nevada receive scarce precipitation during the year. Most rain that falls in the state falls on the lee side (east and northeast slopes) of the Sierra Nevada. The average annual rainfall per year is about 7 inches (180 mm); the wettest parts get around 40 inches (1,000 mm). Nevada's highest recorded temperature is 125 °F (52 °C) at Laughlin on June 29, 1994 and the lowest recorded temperature is −50 °F (−46 °C) at San Jacinto on January 8, 1937. Nevada's 125 °F (52 °C) reading is the third highest statewide record high temperature of a U.S. state, just behind Arizona's 128 °F (53 °C) reading and California's 134 °F (57 °C) reading. The vegetation of Nevada is diverse and differs by state area. Nevada contains six biotic zones: alpine, sub-alpine, ponderosa pine, pinion-juniper, sagebrush and creosotebush. Nevada is divided into political jurisdictions designated as counties. Carson City is officially a consolidated municipality; however, for many purposes under state law it is considered to be a county. As of 1919 there were 17 counties in the state, ranging from 146 to 18,159 square miles (380 to 47,030 km2). Lake County, one of the original nine counties formed in 1861, was renamed Roop County in 1862. Part of the county became Lassen County, California in 1864. In 1883, Washoe County annexed the portion that remained in Nevada. In 1969, Ormsby County was dissolved and the Consolidated Municipality of Carson City was created by the Legislature in its place co-terminous with the old boundaries of Ormsby County. Bullfrog County was formed in 1987 from part of Nye County. After the creation was declared unconstitutional, the county was abolished in 1989. Humboldt county was designated as a county in 1856 by Utah Territorial Legislature and again in 1861 by the new Nevada Legislature. Clark County is the most populous county in Nevada, accounting for nearly three-quarters of its residents. 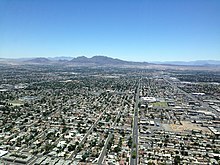 Las Vegas, Nevada's most populous city, has been the county seat since the county was created in 1909 from a portion of Lincoln County, Nevada. Before that, it was a part of Arizona Territory. Clark County attracts numerous tourists: An estimated 44 million people visited Clark County in 2014. 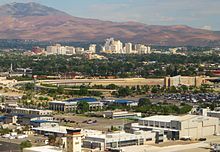 Washoe County is the second most populous county of Nevada. Its county seat is Reno. Washoe County includes the Reno–Sparks metropolitan area. Lyon County is the third most populous county. It was one of the nine original counties created in 1861. It was named after Nathaniel Lyon, the first Union General to be killed in the Civil War. Its current county seat is Yerington. Its first county seat was established at Dayton on November 29, 1861. Mexico in 1824. Alta California included today's Nevada. Francisco Garcés was the first European in the area, Nevada was annexed as a part of the Spanish Empire in the northwestern territory of New Spain. Administratively, the area of Nevada was part of the Commandancy General of the Provincias Internas in the Viceroyalty of New Spain. Nevada became a part of Alta California (Upper California) province in 1804 when the Californias were split. 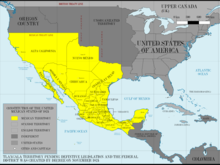 With the Mexican War of Independence won in 1821, the province of Alta California became a territory (state) of Mexico, with a small population. Jedediah Smith entered the Las Vegas Valley in 1827, and Peter Skene Ogden traveled the Humboldt River in 1828. When the Mormons created the State of Deseret in 1847, they laid claim to all of Nevada within the Great Basin and the Colorado watershed. They also founded the first white settlement in what is now Nevada, Mormon Station (modern day Genoa), in 1851. In June 1855, William Bringhurst and 29 fellow Mormon missionaries from Utah arrived at a site just northeast of downtown Las Vegas and built a 150-foot square adobe fort, the first permanent structure erected in the valley, which remained under the control of Salt Lake City until the winter of 1858–1859. As a result of the Mexican–American War and the Treaty of Guadalupe Hidalgo, Mexico permanently lost Alta California in 1848. The new areas acquired by the United States continued to be administered as territories. As part of the Mexican Cession (1848) and the subsequent California Gold Rush that used Emigrant Trails through the area, the state's area evolved first as part of the Utah Territory, then the Nevada Territory (March 2, 1861; named for the Sierra Nevada). See History of Utah, History of Las Vegas, and the discovery of the first major U.S. deposit of silver ore in Comstock Lode under Virginia City, Nevada in 1859. On March 2, 1861, the Nevada Territory separated from the Utah Territory and adopted its current name, shortened from Sierra Nevada (Spanish for "snow-covered mountain range"). The 1861 southern boundary is commemorated by Nevada Historical Markers 57 and 58 in Lincoln and Nye counties. Eight days before the presidential election of 1864, Nevada became the 36th state in the union. Rather than sending the Nevada State Constitution to Washington DC by Pony Express to save time the full text of the State Constitution was sent by Telegraph at a cost of $3,416.77—the most costly telegraph on file for a single dispatch. Finally the response from Washington DC on October 31, 1864 was "the pain is over, the child is born, Nevada this day was admitted into the Union". Statehood was rushed to the date of October 31 to help ensure Abraham Lincoln's reelection on November 8 and post-Civil War Republican dominance in Congress, as Nevada's mining-based economy tied it to the more industrialized Union. As it turned out, however, Lincoln and the Republicans won the election handily, and did not need Nevada's help. In 1866 another part of the western Utah Territory was added to Nevada in the eastern part of the state, setting the current eastern boundary. Nevada achieved its current southern boundaries on January 18, 1867, when it absorbed the portion of Pah-Ute County in the Arizona Territory west of the Colorado River, essentially all of present-day Nevada south of the 37th parallel. The transfer was prompted by the discovery of gold in the area, and officials thought Nevada would be better able to oversee the expected population boom. This area includes most of what is now Clark County and the Las Vegas metropolitan area. Mining shaped Nevada's economy for many years (see Silver mining in Nevada). When Mark Twain lived in Nevada during the period described in Roughing It, mining had led to an industry of speculation and immense wealth. However, both mining and population declined in the late 19th century. However, the rich silver strike at Tonopah in 1900, followed by strikes in Goldfield and Rhyolite, again put Nevada's population on an upward trend. Unregulated gambling was commonplace in the early Nevada mining towns but was outlawed in 1909 as part of a nationwide anti-gambling crusade. Because of subsequent declines in mining output and the decline of the agricultural sector during the Great Depression, Nevada again legalized gambling on March 19, 1931, with approval from the legislature. Governor Fred B. Balzar's signature enacted the most liberal divorce laws in the country and open gambling. The reforms came just eight days after the federal government presented the $49 million construction contract for Boulder Dam (now Hoover Dam). The Nevada Test Site, 65 miles (105 km) northwest of the city of Las Vegas, was founded on January 11, 1951, for the testing of nuclear weapons. 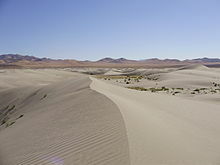 The site consists of about 1,350 square miles (3,500 km2) of desert and mountainous terrain. Nuclear testing at the Nevada Test Site began with a 1 kiloton of TNT (4.2 TJ) bomb dropped on Frenchman Flat on January 27, 1951. The last atmospheric test was conducted on July 17, 1962, and the underground testing of weapons continued until September 23, 1992. The location is known for having the highest concentration of nuclear-detonated weapons in the U.S.
Over 80% of the state's area is owned by the federal government. The primary reason for this is homesteads were not permitted in large enough sizes to be viable in the arid conditions that prevail throughout desert Nevada. Instead, early settlers would homestead land surrounding a water source, and then graze livestock on the adjacent public land, which is useless for agriculture without access to water (this pattern of ranching still prevails). The United States Census Bureau estimates the population of Nevada on July 1, 2018 was 3,034,392, an increase of 61,987 residents (2.10%) since the 2017 US Census estimate and an increase of 333,841 residents (12.36%) since the 2010 United States Census. Nevada had the first highest percentage growth in population from 2017 to 2018. At the 2010 Census, 6.9% of the state's population were reported as under 5, 24.6% were under 18, and 12.0% were 65 or older. Females made up about 49.5% of the population. Since the 2010 census, the population of Nevada had a natural increase of 87,581 (the net difference between 222,508 births and 134,927 deaths); and an increase due to net migration of 146,626 (of which 104,032 was due to domestic and 42,594 was due to international migration). The center of population of Nevada is in southern Nye County. In this county, the unincorporated town of Pahrump, 60 miles (97 km) west of Las Vegas on the California state line, has grown very rapidly from 1980 to 2010. At the 2010 census, the town had 36,441 residents. Las Vegas grew from a gulch of 100 people in 1900 to 10,000 by 1950 to 100,000 by 1970, and was America's fastest-growing city and metropolitan area from 1960 to 2000. From about the 1940s until 2003, Nevada was the fastest-growing state in the US percentage-wise. Between 1990 and 2000, Nevada's population increased 66%, while the US's population increased 13%. Over two thirds of the population of the state lives in Clark County, which is coextensive with the Las Vegas metropolitan area. Thus, in terms of population, Nevada is one of the most centralized states in the nation. Henderson and North Las Vegas are among the top 20 fastest-growing U.S. cities with populations of over 100,000. The rural community of Mesquite 65 miles (105 km) northeast of Las Vegas was an example of micropolitan growth in the 1990s and 2000s. Other desert towns like Indian Springs and Searchlight on the outskirts of Las Vegas have seen some growth as well. Since 1950, the rate of population born in Nevada has never peaked 27 percent, the lowest rate of all states. In 2012, only 25% of Nevadans were born in-state. Large numbers of new residents in the state originate from California, which led some locals to feel their state is being "Californicated". The table below shows the racial composition of Nevada's population as of 2016. According to the 2016 American Community Survey, 27.8% of Nevada's population were of Hispanic or Latino origin (of any race): Mexican (21.3%), Puerto Rican (0.9%), Cuban (0.9%), and other Hispanic or Latino origin (4.7%). The five largest non-Hispanic White ancestry groups were: German (11.3%), Irish (9.0%), English (6.9%), Italian (5.8%), and American (4.7%). In 1980, non-Hispanic whites made up 83.3% of the state's population. As of 2011, 63.6% of Nevada's population younger than age 1 were minorities.. Las Vegas is a minority majority city. According to the United States Census Bureau estimates, as of July 1, 2017, non-Hispanic Whites made up 49.1% of Nevada's population. This would make Nevada a majority minority state joining California, Texas, New Mexico, Hawaii, and the District of Columbia. In Douglas, Mineral, and Pershing counties, a plurality of residents are of Mexican ancestry. In Nye County and Humboldt County, residents are mostly of German ancestry; Washoe County has many Irish Americans. Americans of English descent form pluralities in Lincoln County, Churchill County, Lyon County, White Pine County, and Eureka County. Asian Americans lived in the state since the California Gold Rush of the 1850s brought thousands of Chinese miners to Washoe county. They were followed by a few hundred Japanese farm workers in the late 19th century. By the late 20th century, many immigrants from China, Japan, Korea, the Philippines, Bangladesh, India, and Vietnam came to the Las Vegas metropolitan area. The city now has one of America's most prolific Asian American communities, with a mostly Chinese and Taiwanese area known as "Chinatown" west of I-15 on Spring Mountain Road. Filipino Americans form the largest Asian American group in the state, with a population of more than 113,000. They comprise 56.5% of the Asian American population in Nevada and constitute about 4.3% of the entire state's population. Largely African American sections of Las Vegas and Reno can be found. Many current African-American Nevadans are newly transplanted residents from California. Las Vegas was a major destination for immigrants from South Asia and Latin America seeking employment in the gaming and hospitality industries during the 1990s and first decade of the 21st century, but farming and construction are the biggest employers of immigrant labor. The religious makeup of Nevadans includes large communities of members of The Church of Jesus Christ of Latter-day Saints, Roman Catholics, and Evangelicals; each is known for higher birth rates and a younger than national average age. American Jews represent a large proportion of the active adult retirement community. Note: Births within the table do not add up, due to Hispanics being counted both by their ethnicity and by their race, giving a higher overall number. A small percentage of Nevada's population lives in rural areas. The culture of these places differs significantly from the major metropolitan areas. People in these rural counties tend to be native Nevada residents, unlike in the Las Vegas and Reno areas, where the vast majority of the population was born in another state. The rural population is also less diverse in terms of race and ethnicity. Mining plays an important role in the economies of the rural counties, with tourism being less prominent. 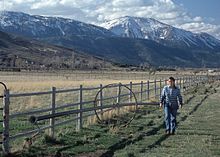 Ranching also has a long tradition in rural Nevada. Church attendance in Nevada is among the lowest of all U.S. states. In a 2009 Gallup poll only 30% of Nevadans said they attended church weekly or almost weekly, compared to 42% of all Americans (only four states were found to have a lower attendance rate than Nevada). Major religious affiliations of the people of Nevada are: Protestant 35%, no religion 28%, Roman Catholic 25%, Latter-day Saint 4%, Jewish 2%, Hindu less than 1%, Buddhist 0.5% and Islam less than 0.1%. Parts of Nevada (in the eastern parts of the state) are situated in the Mormon Corridor. The largest denominations by number of adherents in 2010 were the Roman Catholic Church with 451,070; The Church of Jesus Christ of Latter-day Saints with 175,149; and the Southern Baptist Convention with 45,535; Buddhist congregations 14,727; Bahá'í 1,723; and Muslim 1,700. The Jewish community is represented by The Rohr Jewish Learning Institute and Chabad. Goldstrike (Post-Betze) Mine in the Carlin Trend, the largest Carlin-type deposit in the world, containing more than 35,000,000 troy ounces (1,100 t) gold. 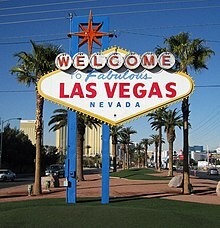 The economy of Nevada is tied to tourism (especially entertainment and gambling related), mining, and cattle ranching. Nevada's industrial outputs are tourism, mining, machinery, printing and publishing, food processing, and electric equipment. The Bureau of Economic Analysis estimates Nevada's total state product in 2010 was $126 billion. The state's per capita personal income in 2009 was $38,578, ranking nineteenth in the nation. Nevada's state debt in 2012 was calculated to be $7.5 billion, or $3,100 per taxpayer. As of December 2014, the state's unemployment rate was 6.8%. The economy of Nevada has long been tied to vice industries. "[Nevada was] founded on mining and refounded on sin—beginning with prizefighting and easy divorce a century ago and later extending to gaming and prostitution", said the August 21, 2010 issue of The Economist. In portions of the state outside of the Las Vegas and Reno metropolitan areas mining plays a major economic role. By value, gold is by far the most important mineral mined. In 2004, 6,800,000 ounces (190,000,000 g) of gold worth $2.84 billion were mined in Nevada, and the state accounted for 8.7% of world gold production (see Gold mining in Nevada). Silver is a distant second, with 10,300,000 ounces (290,000,000 g) worth $69 million mined in 2004 (see Silver mining in Nevada). Other minerals mined in Nevada include construction aggregates, copper, gypsum, diatomite and lithium. Despite its rich deposits, the cost of mining in Nevada is generally high, and output is very sensitive to world commodity prices. Cattle ranching is a major economic activity in rural Nevada. Nevada's agricultural outputs are cattle, hay, alfalfa, dairy products, onions, and potatoes. As of January 1, 2006, there were an estimated 500,000 head of cattle and 70,000 head of sheep in Nevada. Most of these animals forage on rangeland in the summer, with supplemental feed in the winter. Calves are generally shipped to out-of-state feedlots in the fall to be fattened for market. Over 90% of Nevada's 484,000 acres (196,000 ha) of cropland is used to grow hay, mostly alfalfa, for livestock feed. 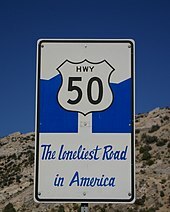 U.S. Route 50, also known as "The Loneliest Road in America"
Road from Carrara, Nevada towards the marble quarry in the background. Amtrak's California Zephyr train uses the Union Pacific's original transcontinental railroad line in daily service from Chicago to Emeryville, California, serving Elko, Winnemucca, and Reno. Las Vegas has had no passenger train service since Amtrak's Desert Wind was discontinued in 1997. Amtrak Thruway Motorcoaches provide connecting service from Las Vegas to trains at Needles, California, Los Angeles, and Bakersfield, California; and from Stateline, Nevada, to Sacramento, California. There have been a number of proposals to re-introduce service to either Los Angeles or Southern California. The Union Pacific Railroad has some railroads in the north and south of Nevada. Greyhound Lines provide some bus service to the state. Interstate 15 passes through the southern tip of the state, serving Las Vegas and other communities. I-215 and spur route I-515 also serve the Las Vegas metropolitan area. Interstate 80 crosses through the northern part of Nevada, roughly following the path of the Humboldt River from Utah in the east and the Truckee River westward through Reno into California. It has a spur route, I-580. Nevada also is served by several U.S. highways: US 6, US 50, US 93, US 95 and US 395. 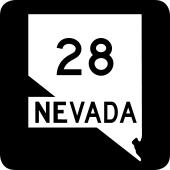 There are also 189 Nevada state routes. Many of Nevada's counties have a system of county routes as well, though many are not signed or paved in rural areas. Nevada is one of a few states in the U.S. that does not have a continuous interstate highway linking its two major population centers—the road connection between the Las Vegas and Reno areas is a combination of several different Interstate and U.S. highways. The Interstate 11 proposed routing may eventually remedy this. The state is one of just a few in the country to allow semi-trailer trucks with three trailers—what might be called a "road train" in Australia. But American versions are usually smaller, in part because they must ascend and descend some fairly steep mountain passes. RTC Transit is the public transit system in the Las Vegas metropolitan area. The agency is the largest transit agency in the state and operates a network of bus service across the Las Vegas Valley, including the use of The Deuce, double-decker buses, on the Las Vegas Strip and several outlying routes. RTC RIDE operates a system of local transit bus service throughout the Reno-Sparks metropolitan area. Other transit systems in the state include Carson City's JAC. Most other counties in the state do not have public transportation at all. Additionally, a 4-mile (6.4 km) monorail system provides public transportation in the Las Vegas area. The Las Vegas Monorail line services several casino properties and the Las Vegas Convention Center on the east side of the Las Vegas Strip, running near Paradise Road, with a possible future extension to McCarran International Airport. Several hotels also run their own monorail lines between each other, which are typically several blocks in length. McCarran International Airport in Las Vegas is the busiest airport serving Nevada. The Reno-Tahoe International Airport (formerly known as the Reno Cannon International Airport) is the other major airport in the state. 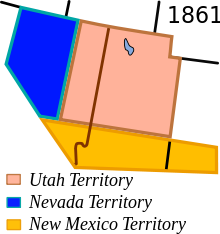 Under the Constitution of the State of Nevada, the powers of the Nevada government are divided among three separate departments: the Executive consisting of the Governor of Nevada and their cabinet along with the other elected constitutional officers; the Legislative consisting of the Nevada Legislature, which includes the Assembly and the Senate; and the Judicial consisting of the Supreme Court of Nevada and lower courts. The Governor of Nevada is the chief magistrate of Nevada, the head of the executive department of the state's government, and the commander-in-chief of the state's military forces. The current Governor of Nevada is Steve Sisolak, a Democract. The Nevada Legislature is a bicameral body divided into an Assembly and Senate. Members of the Assembly serve for 2 years, and members of the Senate serve for 4 years. Both houses of the Nevada Legislature will be impacted by term limits starting in 2010, as Senators and Assemblymen/women will be limited to a maximum of 12 years service in each house (by appointment or election which is a lifetime limit)—a provision of the constitution which was recently upheld by the Supreme Court of Nevada in a unanimous decision. Each session of the Legislature meets for a constitutionally mandated 120 days in every odd-numbered year, or longer if the Governor calls a special session. On December 18, 2018, Nevada became the first in the United States with a female majority in its legislature. Women hold nine of the 21 seats in the Nevada Senate, and 23 of the 42 seats in the Nevada Assembly. The Supreme Court of Nevada is the state supreme court and the head of the Nevada Judiciary. Original jurisdiction is divided between the district courts (with general jurisdiction), and justice courts and municipal courts (both of limited jurisdiction). Appeals from District Courts are made directly to the Nevada Supreme Court, which under a deflective model of jurisdiction, has the discretion to send cases to the Court of Appeals for final resolution. Incorporated towns in Nevada, known as cities, are given the authority to legislate anything not prohibited by law. A recent movement has begun to permit home rule in incorporated Nevada cities to give them more flexibility and fewer restrictions from the Legislature. Town Boards for unincorporated towns are limited local governments created by either the local county commission, or by referendum, and form a purely advisory role and in no way diminish the responsibilities of the county commission that creates them. Nevada, in a burst of ingenuity, built an economy by exploiting its sovereignty. Its strategy was to legalize all sorts of things that were illegal in California ... after easy divorce came easy marriage and casino gaming. Even prostitution is legal in Nevada, in any county that decides to allow it. Quite a few of them do. With the advent of air conditioning for summertime use and Southern Nevada's mild winters, the fortunes of the state began to turn around, as it did for Arizona, making these two states the fastest growing in the Union. Nevada is the only state where prostitution is legal (under the form of licensed brothels). Prostitution is specifically illegal by state law in the state's larger jurisdictions, which include Clark County (which contains Las Vegas), Washoe County (which contains Reno), and the independent city of Carson City. Otherwise, it is legal in those counties which specifically vote to permit it. When permitted, brothels are only in rural or isolated parts of counties. Nevada's early reputation as a "divorce haven" arose from the fact that, before the no-fault divorce revolution in the 1970s, divorces were difficult to obtain in the United States. Already having legalized gambling and prostitution, Nevada continued the trend of boosting its profile by adopting one of the most liberal divorce statutes in the nation. This resulted in Williams v. North Carolina (1942), 317 U.S. 287 (1942), in which the U.S. Supreme Court ruled North Carolina had to give "full faith and credit" to a Nevada divorce. The Court modified its decision in Williams v. North Carolina (1945), 325 U.S. 226 (1945), by holding a state need not recognize a Nevada divorce unless one of the parties was domiciled there at the time the divorce was granted and the forum state was entitled to make its own determination. As of 2009, Nevada's divorce rate was above the national average. Nevada's tax laws are intended to draw new residents and businesses to the state. Nevada has no personal income tax or corporate income tax. Since Nevada does not collect income data it cannot share such information with the federal government, the IRS. The state sales tax (similar to VAT or GST) in Nevada is variable depending upon the county. The statewide tax rate is 6.85%, with five counties (Elko, Esmeralda, Eureka, Humboldt, and Mineral) charging this amount. Counties may impose additional rates via voter approval or through approval of the state legislature; therefore, the applicable sales tax will vary by county from 6.85% to 8.1% (Clark County). In Clark County, which includes Las Vegas, imposes four separate county option taxes in addition to the statewide rate – 0.25% for flood control, 0.50% for mass transit, 0.25% for infrastructure, and 0.25% for more cops. In Washoe County, which includes Reno, the sales tax rate is 7.725 percent, due to county option rates for flood control, the ReTRAC train trench project, mass transit, and an additional county rate approved under the Local Government Tax Act of 1991. The minimum Nevada sales tax rate changed on July 1, 2009. The lodging tax rate in unincorporated Clark County, which includes the Las Vegas Strip, is 12%. Within the boundaries of the cities of Las Vegas and Henderson, the lodging tax rate is 13%. Corporations such as Apple Inc. allegedly have set up investment companies and funds in Nevada to avoid paying taxes. In 2009, the Nevada Legislature passed a bill creating a domestic partnership registry that enables gay couples to enjoy the same rights as married couples. As of 2019, gay marriage is legal in Nevada. Nevada provides friendly environment for the formation of corporations, and many (especially California) businesses have incorporated in Nevada to take advantage of the benefits of the Nevada statute. Nevada corporations offer great flexibility to the Board of Directors and simplify or avoid many of the rules that are cumbersome to business managers in some other states. In addition, Nevada has no franchise tax, although it does require businesses to have a license for which the business has to pay the state. Similarly, many U.S. states have usury laws limiting the amount of interest a lender can charge, but federal law allows corporations to 'import' these laws from their home state. Nevada has very liberal alcohol laws. Bars are permitted to remain open 24 hours, with no "last call". Liquor stores, convenience stores and supermarkets may also sell alcohol 24 hours per day, and may sell beer, wine and spirits. In 2016, Nevada voters approved Question 2, which legalized the possession, transportation and cultivation of personal use amounts of marijuana for adults age 21 years and older, and authorized the creation of a regulated market for the sale of marijuana to adults age 21 years and older through state-licensed retail outlets. Nevada voters had previously approved medical marijuana in 2000, but rejected marijuana legalization in a similar referendum in 2006. Marijuana in all forms remains illegal under federal law. Aside from cannabis legalization, non-alcohol drug laws are a notable exception to Nevada's otherwise libertarian principles. It is notable for having the harshest penalties for drug offenders in the country. Nevada remains the only state to still use mandatory minimum sentencing guidelines for possession of drugs. Nevada voters enacted a smoking ban ("The Nevada Clean Indoor Air Act") in November 2006 that became effective on December 8, 2006. It outlaws smoking in most workplaces and public places. Smoking is permitted in bars, but only if the bar serves no food, or the bar is inside a larger casino. Smoking is also permitted in casinos, certain hotel rooms, tobacco shops, and brothels. However, some businesses do not obey this law and the government tends not to enforce it. In 2011, smoking restrictions in Nevada were loosened for certain places which allow only people age 21 or older inside. Due to heavy growth in the southern portion of the state, there is a noticeable divide between politics of northern and southern Nevada. The north has long maintained control of key positions in state government, even while the population of southern Nevada is larger than the rest of the state combined. The north sees the high population south becoming more influential and perhaps commanding majority rule. The south sees the north as the "old guard" trying to rule as an oligarchy. This has fostered some resentment, however, due to a term limit amendment passed by Nevada voters in 1994, and again in 1996, some of the north's hold over key positions will soon be forfeited to the south, leaving northern Nevada with less power. Historically, northern Nevada has been very Republican. The more rural counties of the north are among the most conservative regions of the country. Carson City, the state's capital, is a Republican-leaning swing city/county. Washoe County, home to Reno, has historically been strongly Republican, but now has become more of a Democratic-leaning swing county. Clark County, home to Las Vegas, has been a stronghold for the Democratic Party since it was founded in 1909, having voted Republican only six times and once for a third party candidate. Clark and Washoe counties have long dominated the state's politics. Between them, they cast 87 percent of Nevada's vote, and elect a substantial majority of the state legislature. The last Republican to carry Clark County was George H.W. Bush in 1988, and the last Republican to carry Washoe County was George W. Bush in 2004. The great majority of the state's elected officials are either from Las Vegas or Reno. Nevada voted for the winner in every presidential election from 1912 to 2012, except in 1976 when it voted for Gerald Ford over Jimmy Carter. This includes Nevada supporting Democrats John F. Kennedy and Lyndon B. Johnson in 1960 and 1964, respectively. Republican Richard Nixon in 1968 and in 1972, Republican Ronald Reagan in 1980 and in 1984, Republican George H.W. Bush in 1988, Democrat Bill Clinton in 1992 and 1996, Republican George W. Bush in 2000 and 2004, and Democrat Barack Obama winning the state in both 2008 and 2012. This gives the state status as a political bellwether. From 1912 to 2012, Nevada has been carried by the presidential victor the most out of any state (26 of 27 elections). In 2016, Nevada lost its bellwether status when it narrowly cast its votes for Hillary Clinton. Nevada was one of only three states won by John F. Kennedy in the American West in the election of 1960, albeit narrowly. The state's U.S. Senators are Democrats Catherine Cortez Masto and Jacky Rosen. The Governorship is held by Steve Sisolak, a Democrat. Nevada is the only U.S. state to have a none of the above option available on its ballots. Officially called None of These Candidates, the option was first added to the ballot in 1975 and is used in all statewide elections, including president, US Senate and all state constitutional positions. In the event "None of These Candidates" receives a plurality of votes in the election, the candidate with the next-highest total is elected. Education in Nevada is achieved through public and private elementary, middle, and high schools, as well as colleges and universities. A May 2015 educational reform law expanded school choice options to 450,000 Nevada students who are at up to 185% of the federal poverty level. Education savings accounts (ESAs) are enabled by the new law to help pay the tuition for private schools. Alternatively, families "can use funds in these accounts to also pay for textbooks and tutoring." The Nevada Aerospace Hall of Fame provides educational resources and promotes the aerospace and aviation history of the state. There are 68 designated wilderness areas in Nevada, protecting some 6,579,014 acres (2,662,433 ha) under the jurisdiction of the National Park Service, U.S. Forest Service, and Bureau of Land Management. The Nevada state parks comprise protected areas managed by the state of Nevada, including state parks, state historic sites, and state recreation areas. There are 24 state park units, including Van Sickle Bi-State Park which opened in July 2011 and is operated in partnership with the state of California. Resort areas like Las Vegas, Reno, Lake Tahoe, and Laughlin attract visitors from around the nation and world. In FY08 the total of 266 casinos with gaming revenue over $1m for the year, brought in revenue of $12 billion in gaming revenue, and $13 billion in non-gaming revenue. A review of gaming statistics can be found at Nevada gaming area. Nevada has by far the most hotel rooms per capita in the United States. According to the American Hotel and Lodging Association, there were 187,301 rooms in 584 hotels (of 15 or more rooms). The state is ranked just below California, Texas, Florida, and New York in total number of rooms, but those states have much larger populations. Nevada has one hotel room for every 14 residents, far above the national average of one hotel room per 67 residents. Prostitution is legal in parts of Nevada in licensed brothels, but only counties with populations under 400,000 have the option to legalize it. Although prostitution is not a major part of the Nevada economy, employing roughly 300 women as independent contractors, it is a very visible endeavor. Of the 14 counties permitted to legalize prostitution under state law, 8 have chosen to legalize brothels. State law prohibits prostitution in Clark County (which contains Las Vegas), and Washoe County (which contains Reno). However, prostitution is legal in Storey County, which is part of the Reno–Sparks metropolitan area. The Las Vegas Valley is home to the Vegas Golden Knights of the National Hockey League who began play in the 2017-18 NHL season at T-Mobile Arena on the Las Vegas Strip in Paradise, Nevada. The Golden Knights are the only major North American professional sports franchise in Nevada. They will be joined by the Oakland Raiders who at the start of the 2016 NFL season expressed interest in moving their team to Las Vegas, and announced in January 2017 they would do so in either 2019 or 2020. Nevada takes pride in college sports, most notably its college football. College teams in the state include the Nevada Wolf Pack (representing the University of Nevada, Reno) and the UNLV Rebels (representing the University of Nevada, Las Vegas), both in the Mountain West Conference (MW). UNLV is most remembered for its men's basketball program, which experienced its height of supremacy in the late 1980s and early 1990s. Coached by Jerry Tarkanian, the Runnin' Rebels became one of the most elite programs in the country. In 1990, UNLV won the Men's Division I Championship by defeating Duke 103–73, which set tournament records for most points scored by a team and largest margin of victory in the national title game. In 1991, UNLV finished the regular season undefeated, a feat that would not be matched in Division I men's basketball for more than 20 years. Forward Larry Johnson won several awards, including the Naismith Award. UNLV reached the Final Four yet again, but lost their national semifinal against Duke 79–77. The Runnin' Rebels were the Associated Press pre-season No. 1 back to back (1989–90, 1990–91). North Carolina is the only other team to accomplish that (2007–08, 2008–09). The state's involvement in major-college sports is not limited to its local schools. In the 21st century, the Las Vegas area has become a significant regional center for college basketball conference tournaments. The MW, West Coast Conference, and Western Athletic Conference all hold their men's and women's tournaments in the area, and the Pac-12 holds its men's tournament there as well. The Big Sky Conference, after decades of holding its men's and women's conference tournaments at campus sites, began holding both tournaments in Reno in 2016. Las Vegas has hosted several professional boxing matches, most recently at the MGM Grand Garden Arena with bouts such as Mike Tyson vs. Evander Holyfield, Evander Holyfield vs. Mike Tyson II, Oscar De La Hoya vs. Floyd Mayweather and Oscar De La Hoya vs. Manny Pacquiao and at the newer T-Mobile Arena with Canelo Álvarez vs. Amir Khan. Along with significant rises in popularity in mixed martial arts (MMA), a number of fight leagues such as the UFC have taken interest in Las Vegas as a primary event location due to the number of suitable host venues. The Mandalay Bay Events Center and MGM Grand Garden Arena are among some of the more popular venues for fighting events such as MMA and have hosted several UFC and other MMA title fights. The city has held the most UFC events with 86 events. The state is also home to the Las Vegas Motor Speedway, which hosts the Kobalt Tools 400. Two venues in the immediate Las Vegas area host major annual events in rodeo. The Thomas & Mack Center, built for UNLV men's basketball, hosts the National Finals Rodeo. The PBR World Finals, operated by the bull riding-only Professional Bull Riders, was also held at the Thomas & Mack Center before moving to T-Mobile Arena in 2016. Finally, Sam Boyd Stadium, home to the UNLV football team, also hosts the country's biggest rugby event, the USA Sevens tournament in the World Rugby Sevens Series, as well as the AMA Supercross Championship. The state is also home to one of the most famous tennis players of all time, Andre Agassi, and current baseball superstar Bryce Harper. Area 51 is near Groom Lake, a dry salt lake bed. The much smaller Creech Air Force Base is in Indian Springs, Nevada; Hawthorne Army Depot in Hawthorne; the Tonopah Test Range near Tonopah; and Nellis AFB in the northeast part of the Las Vegas Valley. Naval Air Station Fallon in Fallon; NSAWC, (pronounced "EN-SOCK") in western Nevada. NSAWC consolidated three Command Centers into a single Command Structure under a flag officer on July 11, 1996. The Naval Strike Warfare Center (STRIKE "U") based at NAS Fallon since 1984, was joined with the Navy Fighter Weapons School (TOPGUN) and the Carrier Airborne Early Warning Weapons School (TOPDOME) which both moved from NAS Miramar as a result of a Base Realignment and Closure (BRAC) decision in 1993 which transferred that installation back to the Marine Corps as MCAS Miramar. The Seahawk Weapon School was added in 1998 to provide tactical training for Navy helicopters. These bases host a number of activities including the Joint Unmanned Aerial Systems Center of Excellence, the Naval Strike and Air Warfare Center, Nevada Test and Training Range, Red Flag, the U.S. Air Force Thunderbirds, the United States Air Force Warfare Center, the United States Air Force Weapons School, and the United States Navy Fighter Weapons School. Nevada enjoys many economic advantages, and the southern portion of the state enjoys mild winter weather, but rapid growth has led to some overcrowded roads and schools. Nevada has the nation's 5th largest school district in the Clark County School District (projected fall 2007 enrollment is 314,000 students grades K-12). Coyote Springs is a proposed community for 240,000 inhabitants in Clark and Lincoln counties. It would be Nevada's largest planned city. The town is being developed by Harvey Whittemore and has generated some controversy because of environmental concerns and allegations of political favoritism. State mottos: "Battle Born" and "All For Our Country"
State slogan: "The Battle Born State"
^ The distinction of highest point in Nevada goes to the summit of Boundary Peak, so named because it is very near the Nevada-California border, at the northern terminus of the White Mountains. 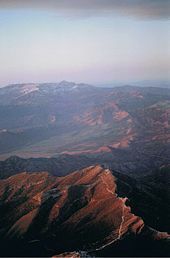 However, Boundary Peak can be considered a subsidiary summit of Montgomery Peak, whose summit is in California, since the topographic prominence of Boundary Peak is only 253 feet (77 m), which falls under the often used 300-foot (91 m) cutoff for an independent peak. Also, Boundary Peak is less than 1 mile (1.6 km) away from its higher neighbor. Hence Boundary Peak can be described as not being wholly within Nevada. By contrast, the prominence of Wheeler Peak, 13,063 feet (3,982 m), is quite large and in fact it is the twelfth largest in the contiguous United States. Wheeler Peak is the highest point in a radius of more than 200 square miles (520 km2) and is entirely within the state of Nevada. ^ "Median Annual Household Income". The Henry J. Kaiser Family Foundation. Retrieved September 18, 2018. ^ "Boundary". NGS data sheet. U.S. National Geodetic Survey. Retrieved October 20, 2011. ^ Also sometimes placed in the Mountain West and Southwestern United States. ^ "Metropolitan and Micropolitan Statistical Areas Population Totals: 2010-2017" (HTML). 2017 Population Estimates. United States Census Bureau, Population Division. Retrieved March 2, 2019. ^ "City and Town Population Totals: 2010-2017". Retrieved March 2, 2019. Rines, George Edwin, ed. (1920). "Sage-brush State" . Encyclopedia Americana. ^ "Federal Land Acres in Nevada" (PDF). U.S. Dept. of the Interior, Bureau of Land Management. Archived from the original (PDF) on September 30, 2006. Retrieved May 7, 2009. ^ "Race and Hispanic Origin: 1790 to 1990 by State" (PDF). Census.gov. US Census. Retrieved July 16, 2014. ^ "Nevada Employment & Unemployment Estimates for November 2010", "Nevada Department of Employment, Training, and Rehabilitation". ^ "Frequently Asked Questions", Nevada Mining Association, accessed January 7, 2011. ^ "Nevada". Wordreference.com. Retrieved February 24, 2007. ^ Clifton, Guy (August 22, 2010). "You heard it right: Bill would let them say Ne-VAH-da". Reno Gazette-Journal. ^ Archive.org "Wayback Machine" view from December 29, 2013: "Nevada: A World Within. A State Apart. | Nevada Travel & Tourism". Travelnevada.com. Archived from the original on December 29, 2013. Retrieved October 7, 2016. ^ a b National Climatic Data Center, Asheville, N.C., and Storm Phillips, Stormfax, Inc.
^ Osborn, Liz. "Driest states". Currentresults.com. Retrieved January 17, 2013. ^ "Nevada climate averages". Weatherbase. Retrieved November 11, 2015. ^ Federal Writers' Project (1940). Nevada: a guide to the Silver state. US History Publishers. p. 11. ISBN 978-1-60354-027-8. ^ a b "Political History of Nevada". 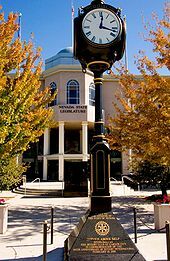 Nevada State Library and Archives. Archived from the original on September 27, 2007. Retrieved August 17, 2007. ^ "Visitors". Clarkcountynv.gov. Retrieved July 27, 2014. ^ Laws of the Territory of Nevada passed at the first regular session of the Legislative Assembly. San Francisco, CA: Valentine & Co. 1862. pp. 289–291. Retrieved May 14, 2014. 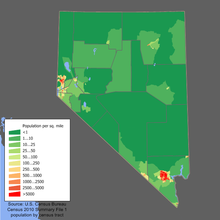 ^ "Nevada's Census Population By County For 2000 and 2010" (PDF). Retrieved May 4, 2013. ^ "Explorers and Settlers in Nevada" (PDF). Washoe County School District. p. 2. Retrieved May 20, 2010. ^ "Online Etymology Dictionary". Retrieved May 20, 2010. ^ Resident Population Data. "Resident Population Data – 2010 Census". 2010.census.gov. Archived from the original on December 20, 2012. Retrieved December 22, 2016. ^ a b "QuickFacts Nevada; UNITED STATES". 2018 Population Estimates. United States Census Bureau, Population Division. March 2, 2019. Retrieved March 2, 2019. ^ "Cumulative Estimates of the Components of Resident Population Change for the United States, Regions, States, and Puerto Rico: April 1, 2010 to July 1, 2016 (NST-EST2016-04)" (xlsx). U.S. Census Bureau. December 20, 2016. Retrieved December 31, 2016. ^ "Download the Centers of Population by State: 2010" (txt). U.S. Census Bureau. Retrieved December 31, 2016. ^ "Pahrump CDP QuickFacts from the US Census Bureau". Quickfacts.census.gov. Archived from the original on January 17, 2013. Retrieved January 17, 2013. ^ doug (August 8, 2008). "People keep moving to Nevada…". gach.co. Archived from the original on May 25, 2017. Retrieved July 31, 2010. ^ a b c "Historical Census Statistics on Population Totals By Race, 1790 to 1990, and By Hispanic Origin, 1970 to 1990, For The United States, Regions, Divisions, and States". Census.gov. Archived from the original on July 25, 2008. Retrieved July 27, 2014. ^ 2010 Census Data. "2010 Census Data". Census.gov. Retrieved July 27, 2014. ^ "U.S. Census Bureau QuickFacts: Nevada". United States Census Bureau. Retrieved November 29, 2018. ^ "U.S. whites will soon be the minority in number, but not power - Baltimore Sun". The Baltimore Sun. Retrieved January 21, 2018. ^ "Nevada – Selected Population Profile in the United States". Factfinder.census.gov. Retrieved January 17, 2013. ^ "Biggest US Cities By Population - Nevada - 2017 Populations". City Population. March 2, 2019. Retrieved March 2, 2019. ^ "$1.3 billion for 288 jobs: The failure of government-subsidized renewable energy". Nevadabusiness.com. October 1, 2012. Retrieved January 17, 2013. ^ REVIEW-JOURNAL, JENNIFER ROBISON LAS VEGAS (May 3, 2014). "Before mining and gambling, ranching shaped Nevada's culture". ^ "Mississippians Go to Church the Most; Vermonters, Least". Gallup.com. Retrieved July 27, 2014. ^ "The Association of Religion Data Archives | State Membership Report". www.thearda.com. Retrieved November 22, 2013. ^ "Summerlin Area Community Events Calendar, Oct. 22-28, 2015". GateHouse Media, Inc. LAS VEGAS REVIEW-JOURNAL. ^ Chabad of Summerlin (December 26, 2012). "Are you an Ethical Person?". Las Vegas Sun. ^ Frank, Dave. "Western Region Gold Deposits (completed project)". ^ "Bureau of Economic Analysis". Bea.gov. Retrieved January 17, 2013. ^ "GDP by State". Greyhill Advisors. Retrieved September 23, 2011. ^ "BEA : Gross Domestic Product by State". Bea.gov. June 2, 2009. Retrieved July 31, 2010. ^ "statedatalab.org: "The 34th worst state" Truth in Accounting" (PDF). Retrieved July 27, 2014. ^ "Local Area Unemployment Statistics". BLS. Retrieved February 8, 2015. ^ "Nevada's Largest Employers – Statewide Archived April 25, 2012, at the Wayback Machine." Nevada Workforce Informer. Nevada Department of Employment, Training and Rehabilitation. ^ Hernandez, Dan. "Nevada solar industry collapses after state lets power company raise fees", The Guardian, London, January 13, 2016. Retrieved on February 17, 2017. ^ a b NV Const. art. V, § 1. ^ NV Const. art. V, § 5. ^ "Court of Appeals". Nevada Judiciary. Retrieved August 12, 2017. ^ Lawrence M. Friedman, American Law in the Twentieth Century (New Haven: Yale University Press, 2002), pp. 596–597. ^ "Nevada's divorce rate exceeds national average – News – ReviewJournal.com". Lvrj.com. Retrieved January 17, 2013. ^ "The Tax Foundation – Tax Research Areas > Nevada". Tax Foundation. Retrieved September 15, 2010. ^ "Sales Tax Map" (PDF). Archived from the original (PDF) on January 29, 2013. Retrieved May 4, 2013. ^ "Taxation Publications". Tax.state.nv.us. Archived from the original on August 13, 2010. Retrieved July 31, 2010. ^ "The Agony and Ecstasy—and 'Disgrace'—of Steve Jobs". The Nation. November 9, 2011. Retrieved January 17, 2013. ^ "Initiative to Regulate and Tax Marijuana". Nevada Secretary of State. April 23, 2014. Archived from the original on August 17, 2016. Retrieved May 23, 2016. ^ "Las Vegas, Nevada "Possession of a Controlled Substance (Drug)" Laws". www.shouselaw.com. Retrieved November 26, 2018. ^ "State smoking ban sparks zone-change request for Gardnerville parcel Nevada Appeal serving Carson City, Nevada". Nevadaappeal.com. October 6, 2007. Retrieved July 31, 2010. ^ "Have Nevada bars given up the smoking habit?". Kvbc.com. Archived from the original on September 29, 2011. Retrieved July 31, 2010. ^ "Black & LoBello smoking ban loosened Archives " Black & LoBello". Blacklobellolaw.com. June 17, 2011. Retrieved July 27, 2014. ^ "Overview of Nevada's CorrectionalSystem". NICIC. January 4, 2009. Archived from the original on February 16, 2008. Retrieved January 4, 2009. ^ "2013 Crime In Nevada Annual Report" (PDF). NV Repository. 2013. Archived from the original (PDF) on November 29, 2014. Retrieved November 21, 2014. ^ "Nevadan political parties" (aspx). Nevada Secretary of State / Party & Committee Information / Organized political parties. Retrieved August 16, 2018. ^ "Office of Nevada Secretary of State Barbara K. Cegavske October 2017 Voter Registration Statistics Total Voters by County and Party". ^ southdem (November 9, 2012). "2012 vs 1960". Daily Kos. Retrieved January 17, 2013. ^ "Not a fan of any candidate? In Nevada, you can vote for 'None of These Candidates'". PBS NewsHour. Retrieved September 12, 2018. ^ "School Choice: Full Education Competition Comes To Nevada". Investors Business Daily. June 1, 2015. Retrieved June 2, 2015. ^ "Nevada – Education Savings Accounts". Retrieved June 5, 2015. ^ "Nevada Aerospace Hall of Fame". Nvahof.org. Retrieved January 17, 2013. ^ "Wilderness.net". Wilderness.net. Retrieved July 31, 2010. ^ O'Daly Lisa. "Van Sickle Bi-State Park - Sierra Nevada Geotourism MapGuide". Sierranevadageotourism.org. Retrieved September 25, 2018. ^ "State-by-State Fact Sheets on Lodging Industry". Archived from the original on May 2, 2010. ^ "Clark County School District: Overview". Las Vegas Sun. Retrieved January 17, 2013. ^ Brean, Henry (July 6, 2006). "'Lovefest' for Coyote Springs". Las Vegas Review-Journal. Archived from the original on July 17, 2006. Retrieved July 6, 2006. "Nevada State Guide". Library of Congress. "Nevada State Databases". ALA. Annotated list of searchable databases produced by Nevada state agencies and compiled by the Government Documents Roundtable of the American Library Association.